One of the gifts I received at the baby shower when I was pregnant with Juliana, was a small food mill designed for making baby food. When I opened it, I laughed and said – apparently I am going to have time to make baby food. Once Juliana was born and we neared the time for solid food, I started to look into making her food and realized that it wasn’t that difficult. So for her first few months, she had the standard boxed baby cereal and I made her fruits and veggies. Foods that I made in those early eating months included: acorn squash, applesauce, pears, sweet potatoes, apricots, peaches, plums, carrots, mangos, papayas. And then the basic mush and feed – bananas and avocados. 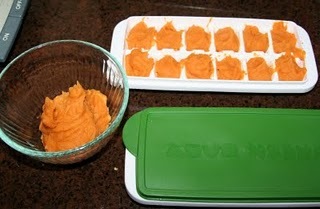 I bought a kit that included a “cookbook” and covered ice cube trays for freezing the food. Cookbook may be stretching it – the book give basic instructions and ideas for combinations. I made notes in the book about when I first made a certain food and what Juliana liked and disliked. Her favorite food as marked in the book was yogurt mixed with peaches. I don’t think I will be making much of the food for the boys. In some cases it isn’t cost-effective and some foods are more time consuming than others. 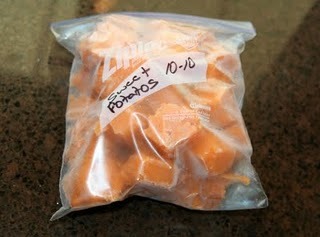 I will be making some of the easy stuff and that includes items I can buy frozen to start since those items are already prepped (frozen sliced peaches, peas, green beans). 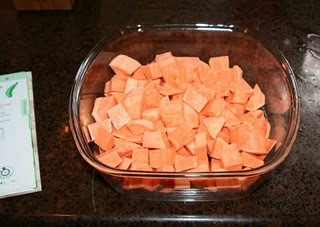 This week I made sweet potatoes and it was as quick and easy as I remembered. 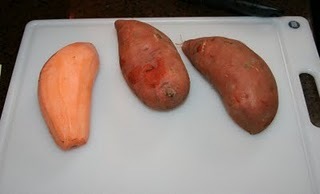 I spent $2.08 for the 3 sweet potatoes and made 32 oz of thick puree (about twice as thick as the Gerber first foods variety). I prefer to make the food thicker to freeze and then add water after it is defrosted so I can serve it with less water as they get used to each new food. 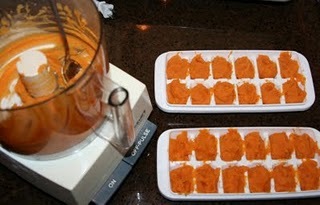 2 – Add 2 TBs water, cover and microwave 10 minutes, let stand 5 mins.